I'm delighted to share some juicy news, and juicy little berries with you today, all from the Zoya Delight collection! This is Zoya's Spring 2015 collection, and it's stunningly spring. 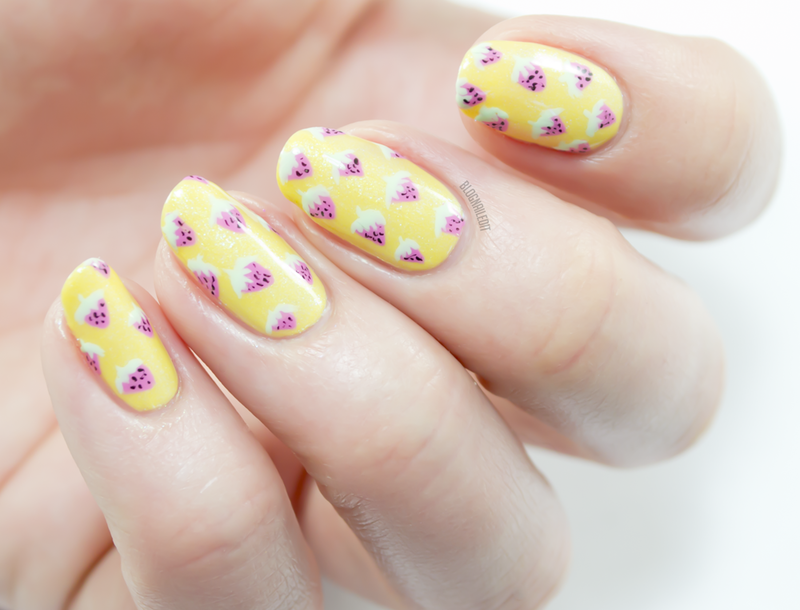 My favorite color is yellow, so I fell in love with the base for this nail art, Daisy, instantly. I did some tiny little strawberries with Eden and Tiana. This design wasn't hard, though I wish I'd been more careful and precise with the seeds on the berries. Maybe I need to get my vision checked! Let's see Delight on its own, with individual swatches. Enjoy! See why I fell in love with Daisy (3 coats)? This is a daffodil yellow with iridescent shimmer. Eden (3 coats) doesn't have any sparkle...it's a bubblegum pink creme. Leslie (2 coats) is a light lavender with the same iridescent sheen as Daisy. I found this shade a little difficult to work with unfortunately. Lillian (3 coats) works nicely, though it does take 3 coats, and it's a great shade. It's a robin's egg tealy-blue creme. I totally love Tiana (2 coats), and that might be because of the memories it invokes when I see it. As a kid, I'd get rainbow sherbet for dessert, and the best way to eat it was to stir it up and blend its colors together. This minty green matches that memory perfectly! Last but not least, Rayne (3 coats) - a baby blue iridescent shimmer. I personally gravitate toward the creme shades in their Spring 2015 collection...do you like those or the shimmers more? How would you use these for nail art? The Delight collection is live on Zoya.com now! cute dainty little strawberries you did ! Love the nail art you created with these shades!